Yesterday:Crown Princess Mette-Marit opened the 6th National Congress on substance abuse and mental health in Oslo Congress Centre. I love her purse. Any idea on the designer? 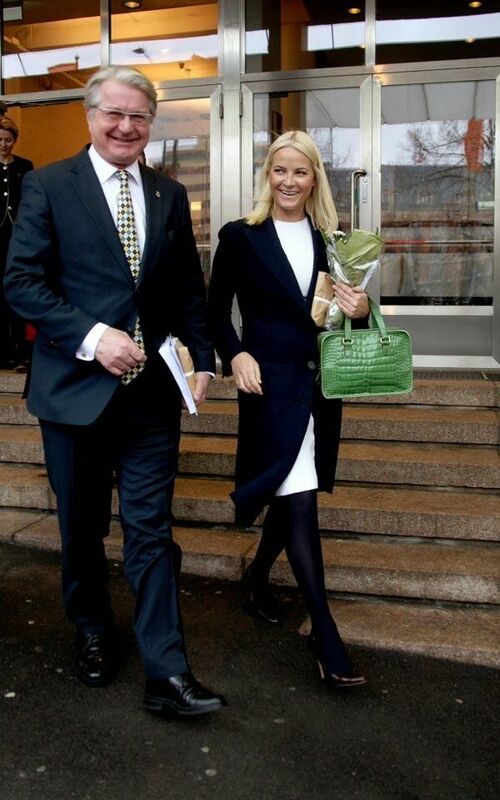 I love Mette-Marit. I wonder what they call her for short? I do like this coat and dress combination, but would have preferred she had not used the black hose. They are jarring against the white dress. The shoes look like they might be brown though I am pretty sure that that would just be the lighting in the picture. I do like the punch of color that her bag offers. I am very glad that she is back on her feet and I just have to say that Haakon is getting better with age, much better than when they married. And they obviously adore one another!! Love her! !